The Week of Prayer for Christian Unity was marked by a number of events in the Catholic Diocese of Tarbes & Lourdes which our Reader John Errey attended. 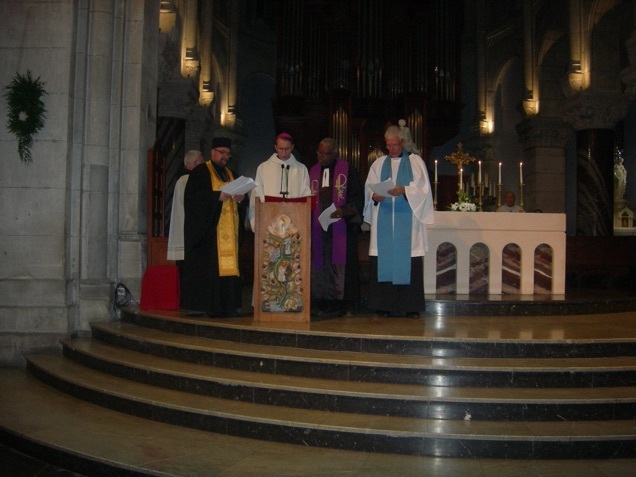 There were services on each of the Sundays, the first being in Lourdes with The Bishop of Tarbes & Lourdes. As you can see in the pictures all four main Christian communities were represented, Roman Catholic, Orthodox, Protestant and Anglican. There was also a debate on Ecumenicalism at which John gave the attached address. All parties were agreed that we need to work together in mission and also where possible involve other faiths as with the hour of prayer in Tarbes after the Paris November attacks when we were joined by the Jewish and Moslem communities. The Anglican Church in France own’s just 8 churches, but has just over 80 worship centres. So we are very grateful and dependant on the good relationships we have with our Christian colleagues as we use Churches of various denominations across France. Generally relations are very good. On the Roman side relations are looked after within French ARC French Anglican Roman Commission and on the Protestant side we have The Reuilly Contact Group. Both meet regularly looking at relations nationally. We all (RC, EPUF, EEL and HolyTrinity) have a part in the "J'avais faim" programme providing hot lunches for the needy 6 days a week through the winter period. * we all belong to the "Conseil Chrétien de Solidarité Cannes", which monitors social needs in the town and works with the Mairie to take action on these matters. In Lyon the leaders of the various Churches meet together for weekly Bible readings, prayers and a talk over coffee. Many Churches hold Joint Carol services in both English and French as some of you have experienced. Co-operation / dialogue is difficult in places, as with all things it is partly down to personalities as much as theology. In some places it is pushed by individual Church members with little or no involvement of the local priest. ‘ causes us to look outwards, away from those things that divide us, and to find ourselves shoulder to shoulder with others with whom we may disagree profoundly but with whom we share one unutterably precious thing, that we both love Jesus Christ and for his sake we are doing what we are doing. The more we are engaged in these works of mission, carrying in word and action the Good News of Jesus Christ to a world that is more and more in need of Him, the more we find ourselves regarding those with whom we disagree as fellow Christians, who may be wrong but with whom we are called to live, whose love we receive and to whom we owe such love. In short he said ‘If you want to get on together, get on with mission, together’.